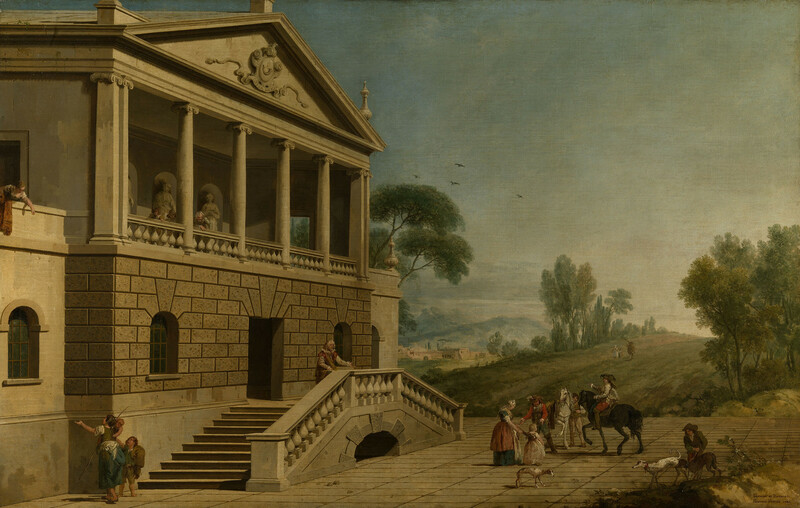 The picture is one of a series of eleven English architectural subjects painted collaboratively by Antonio Visentini and Fransceso Zuccarelli for Consul Joseph Smith. Trained as a painter, Visentini had an association with Consul Smith which began around 1717, and led to his production in 1735 of a set of engravings after Canaletto’s series of views of the Grand Canal in Smith’s collection. Visentini was also to act as an architect and general artistic factotum for Smith until the latter’s death in 1770. Smith and Visentini shared a great interest in the designs and theories of the sixteenth-century Venetian architect Andrea Palladio, whose work they considered superior to that of later baroque architects. Smith published a reprint of Palladio’s architectural treatise, 'I quattro libri', in 1768, and in 1743-4 he had commissioned from Canaletto a series of pictures depicting Venetian monuments, including the principal buildings of Palladio in imaginary settings. It was perhaps the combination of their interest in Palladio and the commission to Canaletto that prompted Smith to commission the series of overdoor capricci of English neo-Palladian buildings to which this image belongs. Visentini painted the buildings using volumes of British architectural engravings for reference, whilst Francesco Zuccarelli painted most of the figures and all of the landscape settings. They date from 1746 and were possibly intended as overdoors for the Consul’s villa at Mogliano, on the Venetian mainland near Treviso. Eight of the views were hung in the Entrance Hall at Buckingham House by 1819. They were moved to the Grand Corridor at Windsor Castle in 1828. At the left is the Pavilion, with a paved terrace before it and a dual flight of steps leading to the door. Above is a portico topped loggia with a balustrade, on which figures lean. On the terrace are grouped a woman, children, a beggar and horsemen. At the right is a landscape. Eastbury, in Dorset, was begun for George Doddington on designs by Sir John Vanbrugh and continued for Doddington's nephew, George Bubb Doddington, on his succession to the estate in 1720. The house was largely blown up and razed in 1775. The architectural portion of this work is based on the elevation engraved in Colen Campbell's Vitruvius Britannicus, as the Bagnio at Eastbury.